Robert Stanley Armstrong was born in Red Deer, Alberta, in 1984. He attended Hunting Hills High School. Rob moved to Edmonton in 2006 for a while, and then he moved back to live at home. In his spare time Rob likes watching wrestling, movies, reading science fiction comics, and writing humorous stories on his computer. 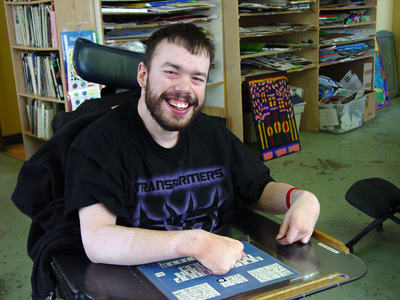 An excellent draftsman, Rob draws to “blow off steam,” and finds that immersing himself in creating artwork helps to alleviate “heartbreak.” As well as hopes of becoming a screenwriter or a filmmaker, Rob wants to find a cure for cerebral palsy.